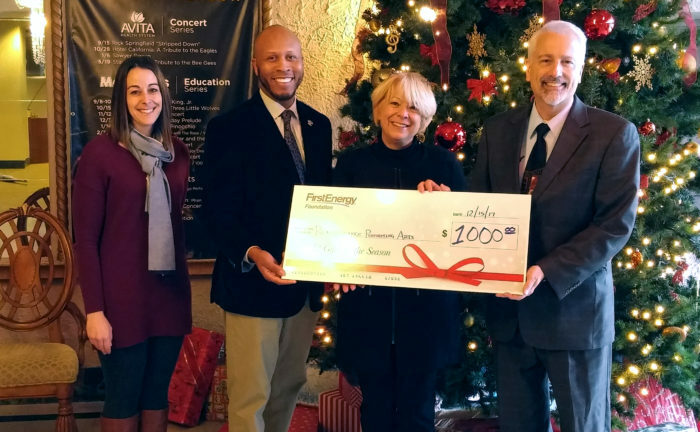 Earlier this month, the FirstEnergy Foundation announced that would surprise 132 deserving nonprofit agencies in the FirstEnergy Corporation area with donations over the coming weeks as part of its “12 Gifts of the Season” holiday campaign. The Renaissance Theatre is happy to announce that they have been the lucky recipients of one of these gifts. The gift for $1,000 was presented by Victor Coleman, Jr., Ohio Edison’s External Affairs Manager for an 8-county area, to the Renaissance President and CEO Michael Miller, Executive Director Chelsie Thompson, and Director of Development Sandi Arnold on December 15th. The gift will be included in the Renaissance Annual Fund Campaign, which will run through December 31, 2017. The campaign is led by two matching gifts, provided by the Richard and Arline Landers Foundation for $25,000 and Sharon Granter, who contributed $20,000 in memory of her late husband Don. The FirstEnergy Foundation is funded solely by FirstEnergy Corp. and provides support to non-profit, tax-exempt health and human services agencies; educational organizations; cultural and arts programs and institutions; and civic groups in areas served by FirstEnergy’s 10 electric operating companies and in areas where the company conducts business.